Fans of the Final Fantasy franchise will rightly claim that these games are some of the best RPGs ever made, with the likes of Final Fantasy VII having attained classic status over the years. So it makes sense that the upcoming Final Fantasy XV is one of the year’s most eagerly anticipated releases, and will also be the first Final Fantasy game to feature open-world gameplay. In the game, the Kingdom of Lucis is under attack by the empire of Niflheim, and King Regis must rely on his successor, his son Noctis, to stop the invasion and bring peace to the kingdom. Aided by characters like the mysterious beauty Lunafreya, Noctis and his pals will have to tackle powerful adversaries like Aranea Highwind, who’s looking to take out Prince Noctis in battle. Final Fantasy XV looks set to feature the usual high fantasy story and also the beautiful imagery that players have come to expect from the series, while also offering players plenty of action-packed combat with swords and magic as can be seen in the gameplay video above. In this video we see Noctis and his party tackle several enemies, including a towering, blue-skinned giant and a dinosaur-like creature (the Bandersnatch), which end up being no match for protagonist Noctis and his pals. 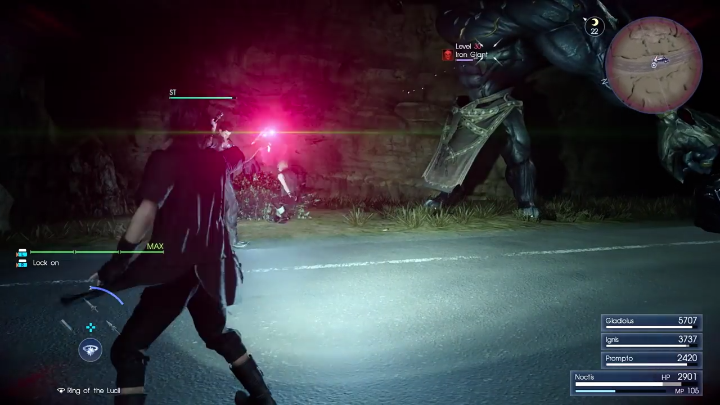 This is in part due to the powerful “death spell” Noctis gets to use in this gameplay demonstration, which drains the HP (Hit Points) of enemies, and is one of the most powerful spells available to players in the game. And there’s no doubt that the game’s combat and story have looked great in the preview videos we have seen so far, suggesting Final Fantasy XV might end up being one of the top role-playing games of the year when it’s released in late November.